15 H.P. New Arrol-Johnston Car. 114. 15 H.P. New Arrol-Johnston Car. Issued By Lambert & Butler. (1908). Card Number 14 From A Set Of 25 Entitled "Motors". Size: Ca. 2.75" X 1.4". Recto: Side View Of The Vehicle With Standing Man At Front. At Top: Lambert & Butler's Cigarettes. At Bottom: 15 H.P. New Arrol-Johnston Car. Verso: Motors | A Series Of 25 | 14 | 15 H.P. 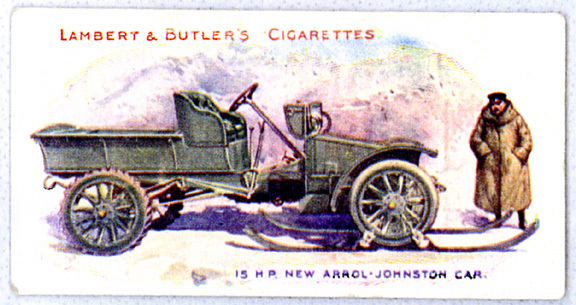 New Arrol- | Johnston Car. | 15 H.P. Air-Cooled Engine, With Special Anti-Freezing Arrangements. Foot Warmers Heated By The Exhaust Gas. Tank At Side For Melting Snow For Drinking Purposes, Heated By Exhaust Gas. Folding Wind Shield Made Of Talc. The Construction Of The Driving Wheels And Of The Runners Speaks For Itself. A Burberry Weave Cloth Is Carried In The Car And Is Arranged To Cover The Whole Vehicle, Making A Sort Of Tent. | Issued By Lambert & Butler | Branch Of The Imperial Tobacco Co | (Of Great Britain & Ireland), Ltd.